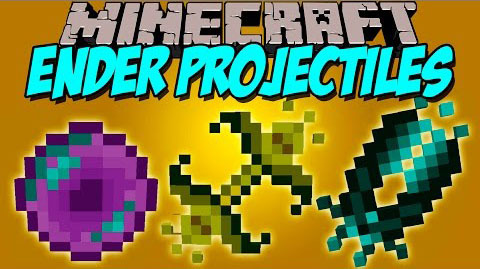 Ender Projectiles Mod installs to Minecraft torches, lighting bolts and other throwable items with a unique effect when it lands like ender pearls. Ender Bomb: Will cause an explosion when it lands. Upgrade three times by adding gunpowder. Ender Blaze: Blaze powder, ender pearl, and flint to throw this and set fire to the landed area, or to any mob you hit. Ender Torch: Places a regular torch when it lands. Ender Snow: Places a snow layer when it lands, or increments up the existing snow layer by 1 if it lands on snow. Ender Wheat: Harvests and replants crops in the area nearby where it lands (all crops, not just wheat, including most crops from other mods, and pumpkin/melon steams not blocks). Ender Lightning: Spawns a lightning bolt when it lands. Ender Water: Sets a water source block when it lands. Ender Shears: Harvests a sheep that it hits. Otherwise drops as an item. Ender Ruby: Tries to find your bed.